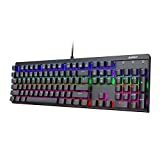 If you have ever shopped for a Mechanical gaming keyboard or are interested in one you will quickly find out that they are not the cheapest keyboards you can purchase. However the increased demand and popularity for these items have opened up the industry to more completion. 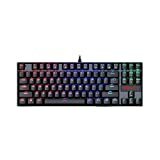 Now you can find mechanical keyboard options for far less than the traditional 100 dollar plus price tag. We have taken a look at the Redragon k552 Kumara mechanical gaming keyboard and will tell you what we think. Out of the box the weight is what you would expect of a quality mechanical keyboard. It feels a couple pounds in weight which is about right for these keyboards. You can tell its solid just by picking it up, and that’s what you want. The Redragon K552 Kumara has rubberized feet with the tilt up position if desired. This keyboard stays down and doesn’t go anywhere. One of the first things we noticed is that it doesn’t have a number pad, known as being “Ten Keyless”. Our personal favorite. Having a number pad means having to lift your hand further to the mouse. If you’re a gamer this may mean a couple fractions of a second. If you’re an everyday worker, this means a more nature shoulder width set up and positioning of your body while using the mouse. The keyboard came with a key puller and a manual. It connects to the computer through one USB port (not two). We picked up the single color model which is the red. Very nice, with 9 different shades of red so you can set it at its brightest or completely turn off the red back lighting. The keyboard has 87 Anti-ghosting keys. Yes, they do have the clicky sound and that tactile feel. They are not “Cherry” keys, but they are an equivalent. They’re advertised as greens but they feel like blues, greens and blues feel very similar though. The board does not come with O-rings installed. So you do get a slight bottoming out feel, which is nature as most boards don’t come with O-rings. The typing feels the way it should with proper and even feedback on each individual key. Some people say that this keyboard is loud, but this keyboard sounds like any other clicky keyboard to us. 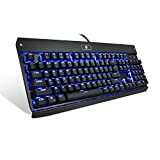 Compared to other Mechanical gaming keyboards that we have tried I’d say this keyboards is right on point. The feel and action is what you would come to expect on any quality mechanical keyboard. Roll Over: 100% anti-ghosting & conflict-free keys. Durability: Custom mechanical switch longevity with responsiveness. Sound & Feedback: Audible click sound, and tactile bump. 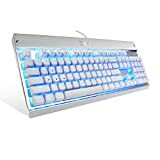 Key Customization: Switchable W A S D and arrow keys for specific applications and/or gaming. Support: Windows 10, Windows 8, Windows 7, Windows Vista, Windows XP or later operating system.